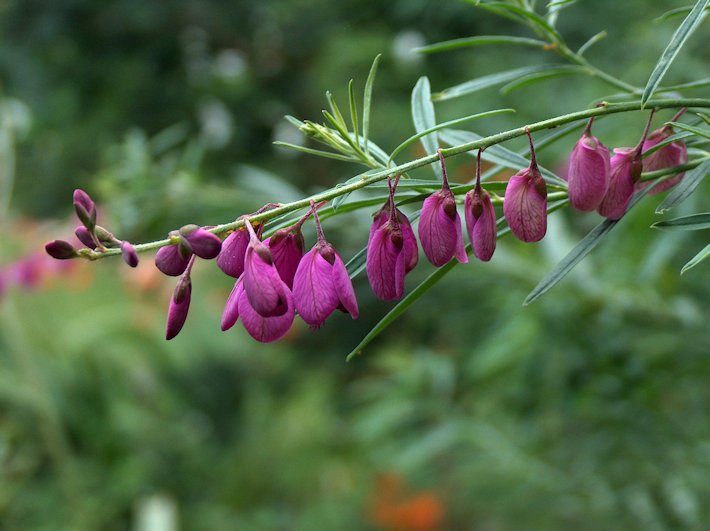 Purple broom; Afrikaans: Bloukappies; isiZulu: ithethe, unohlonishwayo obomvu; Sesotho: hlokoa-le-lelie, ntsebele-ea-moru. One of the lazy pleasures of a hot summer’s day is watching fat carpenter bees buzzing nectar from the plump purple flowers of Polygala virgata. This shrub is the spindly relation of the very popular small tree Polygala myrtifolia. As it never reaches more than 2m, it is absolutely ideal to add height to a mixed border without adding too much weight. It is fast growing and best planted in groups for an eye catching effect. Polygala self seeds readily, so although the plants get a bit scraggly after a season or two, there are always new ones to replace them. Seedlings are fast growing and flower after about 6 months. Flowering continues for much of the year with the drooping magenta blooms fading to cream with pink veins. An unusual white form can often be seen in the dense stand on the side of R103 near the Midmar Dam wall. The cut flowers last well in the vase, adding a whimsical touch to your arrangement. Naturally found on forest edges, the leaves are a favourite food of browsers. The leaves and stems are used in traditional medicine and infusions of the roots are taken as blood-purifying emetics.